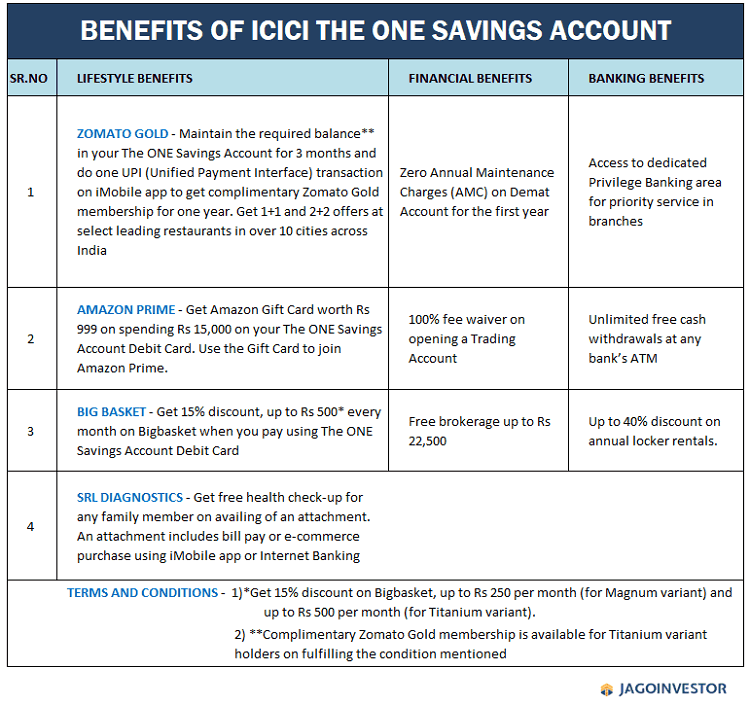 ICICI "The ONE" Savings Account features and a quick review ! ICICI Bank has come up with a “The ONE Savings Account” which is going to benefit the high income/network investors who are looking for more better and premium features. Let us understand the features and benefits of this account. Any salaried or self-employed individual can apply for these accounts as per eligibility criteria. It’s not applicable for companies, Hindu Undivided Family or any other corporate body. There are two variants to this account called as Magnum and Titanium. Below are the balance requirement and more details. Amazon prime subscription of 1 year and many more. Below are the complete details of the benefits of this account. Note that you need to keep a high account bace in your saving bank account to be eligible for these benefits, so in a way you are also loosing on the interest part which you could have potentially earned. So keep that in mind, and then take the decision if you want to go for this or not! Funny though.. 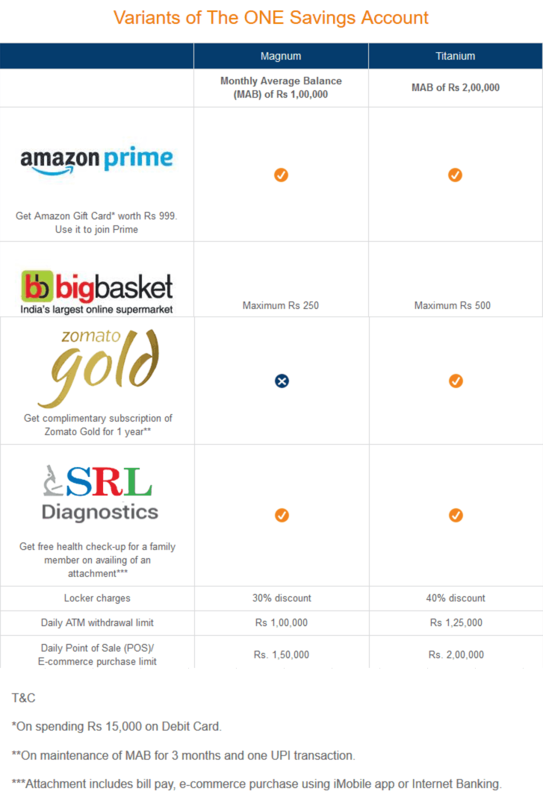 I can easily get Amazon Prime and Zomato Gold annual plan for around 2500 Rs. why do I need to put Rs. 1,00,000/- average monthly balance to get these? either some important benefits are missing here or ICICI banks think who ever has high bank balance do not have common sense. Yes, that’s correct. One can get the benefits on their own, but there are many people who prefer to keep that high balance. If you look mathematically, it does not make sense to go for this kind of saving account, but in real life, there are people who are like that! Sorry but this article is really bad !! I usually like the articles here, but this is really badly presented and researched. The article mentions clearly that’s its 1 lac (MAB) . The article was intended only to mention about this product and inform readers. No analysis was done from our end (there is no analysis to be done I guess). Please ignore these kind of articles if this does not suit your reading style. There is audience for all kind of content, so need to cater to everyone. I hope you understand. One way to look at is the facilities for the minimum amount. From that perspective, the first plan costs 8000/year and second plan 16000/y(considering 8%). If this is OK, one can opt for it.